← Summer vacation loans are landing! 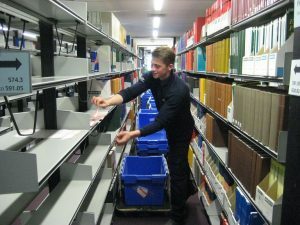 Our Library Refurbishment Project moved into another phase as we shifted around various print materials on the Library Building’s 2nd, 3rd and 4th Floors. 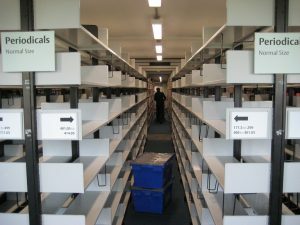 Throughout the Project, you will always be able to access print books here, but they will move location as work is carried out on different floors. We are creating space for books by moving print journals off site. 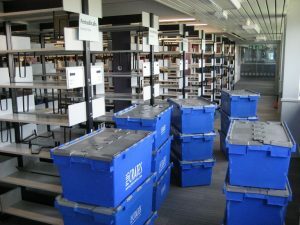 If you have any difficulty locating anything during the moves, please ask Library staff for help at the 2nd or 4th Floor Information Desks. We began to move print journals from the 2nd, 3rd and 4th Floors off-site from the week of 22 May 2017 and completed the process by 27 June. A few print journals were identified as essential for study and teaching. Exceptionally, these remain in the Library Building at the back of the 4th Floor, next to legislation and European Documentation Centre (EDC) material, along with all new issues of current titles. Most people now prefer to use journal articles online. In recent years we have worked hard to increase access to a wider variety of good quality, online academic resources, including those from Springer, Wiley, Taylor & Francis, Sage, Oxford University Press, Cambridge University Press, Elsevier on ScienceDirect and Project Muse. Library staff have secured reading list items as online scans within Talis online reading lists or within the Course Collection. We have kept a few print journals at Reading where special circumstances require. The Enterprise catalogue tells you where to find it (collect yourself from Library Building shelves, or order closed access/Off-site Store items online and collect from the URS Building). Should Library members need a print journal currently away in storage, we provide a free copy through our Inter-Library Loan service (the Enterprise catalgoue shows the location as ‘Unavailable – request inter-library loan’). 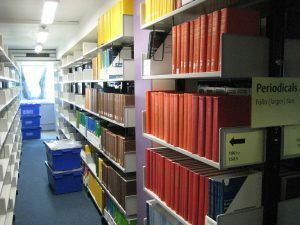 See our other post about arts and humanities books moving from the 3rd to the 2nd and 4th Floors. Find out more about the Library’s major £40 million refurbishment on the Library Refurbishment Project webpage (see FAQ 3 and 6 regarding journals) or email us at library@reading.ac.uk. This entry was posted in Borrowing and viewing material, General news, Refurbishment. Bookmark the permalink.